Communicating with your customers effectively is the basis of every successful marketing campaign. If you don’t reach your customers in the right way, or with a message they understand, your marketing budget will be wasted. If your business serves an international customer base then communicating with them in a language they understand becomes all the more important. That’s where multilingual content marketing can help. 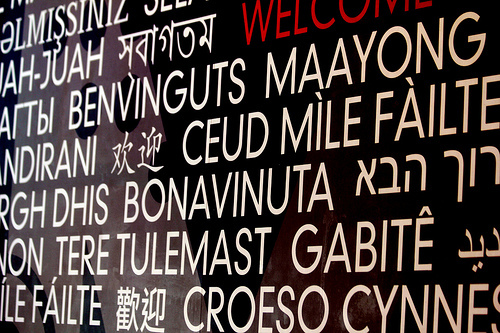 What is multilingual content marketing? Content marketing is the process of creating and sharing free information that is valuable to a prospect or customer. The aim of the content is to turn a prospect into a customer, or a one-time customer into a subscriber or repeat buyer. At each stage of the buying cycle, different types of content will help to achieve this goal. For example, a consumer at the research stage of buying a new car might search online for something like, ‘best used cars under £3,000’, whereas a consumer further along their buying journey might search, ‘used Renault Clio in London’. Your aim as a content marketer is to answer the consumer’s questions as they progress along the buying journey with high quality, well researched and impartial information. Then, when it comes to making a purchase, who are they going to turn to? Hopefully, you. In the early days, the English language dominated online, but now all that has changed. Only about half of the most visited websites are English and the amount of content being produced in other languages is growing at a much faster rate. Asia currently has more internet users than the US and Western Europe put together, while the country with the most social media users in 2016 was South Korea. If you want to tap into these markets, you have to adapt your content to meet the needs of the native consumer, because one thing’s for sure, if you don’t, someone else will. Of course they do. The only surprising thing about that figure is that it’s not higher. There’s a time and a place to improve your second language skills, but when you’re searching for information about how to unblock your sink or fix your carburettor, that’s probably not it. 53 percent of consumers said they would ‘accept’ visiting an English website if there was no other choice, but clearly, any site with native language content will be their preference. In fact, research by Common Sense Advisory found that 56.2 percent of the consumers they surveyed said local language content was even more important than price. Consumers in overseas markets will only be able to buy from your business if they can find you online, and that is down to your multilingual SEO. Content now has a huge part to play in determining where the search engines will rank you for the key terms that are relevant to your business. In markets where competition is low, a decent quantity of high-quality native language content could get you to the top of the rankings in a relatively short period of time. A blog by Salesforce refers to a study of Fortune 500 companies, which found that business which had localised their content were twice as likely to increase their profit and 1.25 times more like to grow their earnings per share year-on-year. We’ve established that people prefer to read content and buy from websites written in their own language, and that native language content is a hugely important factor in your search engine rankings. Surely then, now is the time to kick-start your overseas expansion with a multilingual content marketing campaign. For the help you need, contact Linguistica International today. Our multilingual copywriting and transcreation teams can create content that hits the right note in every language.